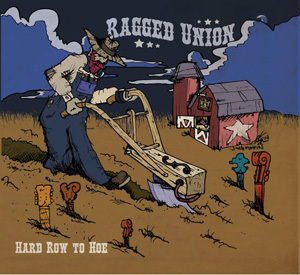 Ragged Union's blistering debut album, "Hard Row To Hoe" isn't hard to love at all. When bluegrass is played right it's impossible to resist the allure of that mountain music sound; and Ragged Union get it oh so right. Since 2014 the husband and wife-led Colorado six-piece has played a substantial number of Bluegrass events, including Mid-Winter Bluegrass Festival. Maybe the union isn't so ragged after all? Let's find out. I've got a secret weapon when it comes to finding out how lively a bluegrass album is; a little lad who I take to school most days in the car. If he giggles during an album play-through, then you know it's a good'un. He laughed all the way through so it's safe to say that Hard Row To Hoe is a winner on that front. Everything about Ragged Union's first release suggests energy and gusto - it's old style bluegrass reinvented for a modern audience! Geoff and Christina Union both have great traditional bluegrass voices, and together they compliment one another on soaring harmonies that are both sweet and intimate. This is best heard in "Run Rabbit Run" and the scorching opener "Simple Life". Anyone who likes a bit of 'grass will know that it's not all about singing. More often than not great bluegrass pickers will give their instruments a voice through fiery solos. There are no shortages of those with Ragged Union - especially on instrumental tracks, "All Rested" and "High Line" which are excellent showcases of the Union's musical prowess. Hard Row To Hoe boasts tracks that are so infectious (in a good way) that upon listening in the car, my feet were going wild; causing me to brake and accelerate like a madman! Be warned that fiddle-driven whirlwind, "Where's Pappy" and strings-abound "Ferris Wheel" have the potential to cause a traffic accident! Sometimes bands concentrate on creating a tight sound that they lose the flair and emotion behind the music. Thankfully Ragged Union didn't fall into that trap on Hard Row To Hoe, retaining a live show sound throughout the album. This is really important for music such as bluegrass, country and the blues, which have strong roots in the culture they originate from. The album has a great mix of originals and covers, which integrate so seamlessly I didn't even realise they were covers at all! Hard Row To Hoe takes you back to a simpler time where music was traditionally a central part of people's lives. These guys (and girl) will wow you with sweet harmonies, furious instrumentals and a modern take on traditional bluegrass storytelling. Give it a listen and you will be united in my opinion of what a stand-up debut album this is for a new group on the bluegrass block!